(Bloomberg) -- Snow, ice and rain will sweep across the eastern U.S. starting Tuesday, giving commuters in New York and the Northeast a couple of slippery trips to and from work and potentially tying up air traffic throughout the region. 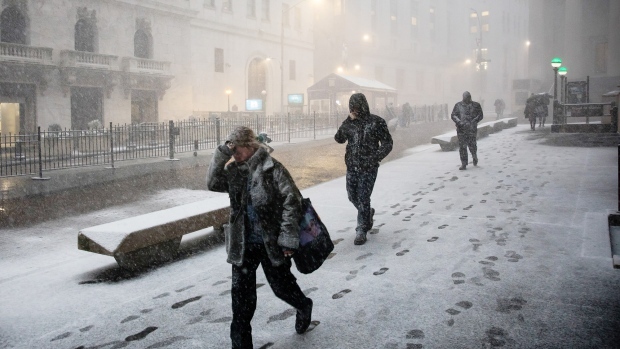 A low-pressure system tracking across the Midwest and the Great Lakes will put New York, Boston and the other cities along Interstate 95 right at the edge of the snow, ice and rain line, said Brain Hurley, a senior branch forecaster with the U.S. Weather Prediction Center in College Park, Maryland. New York could start as snow, getting as much as 4 inches (10 centimeters) before rain pushed along by gusty winds turns that to slush through Wednesday. “The bullseye for snow, of 12 to 18 inches, will really be across upstate New York into Northern Maine, with a large area getting 6 to 12” inches, Hurley said. It will be a great storm for the ski resorts across northern New England, with cold dropping down behind the system to keep the snow in place. A coating of snow and ice has already fallen in Washington, causing a two-hour delay for government offices, according to the Office of Personnel Management. Winter weather advisories and storm watches line the coast from Virginia to Maine as well through the Midwest into the Great Lakes. The combination of wind, snow and freezing rain should be enough to cause delays at airports throughout the Northeast as planes will have to be deiced before taking off. In addition to upstate New York and northern New England, eastern Iowa, Wisconsin and northern Michigan will probably have the worst snow. Over the weekend the Pacific Northwest got pummeled by snow, with almost a foot falling at Seattle-Tacoma Airport, the National Weather Service said. After the mid-week storm pulls out, temperatures will climb past 50 degrees Fahrenheit (10 Celsius) in New York and Washington before a second system starts to move east this weekend. It too will mainly track inland, leaving the coastal cities on the edge of mix of rain, snow and ice, Hurley said.